Local Community Links – The Dental Practice was delighted to present a talk on Oral Health to Year 1 pupils of our local school, Fairfields Nursery and Primary School. This was part of the school’s science week and gave us a further opportunity to fulfil our remit to educate young children in the local community. All our patients undergo oral cancer screening as part of our oral health check. The guidelines are supported by best evidence and based on consensus from key international experts. Daily cleaning of the dentures using mechanical action – brushing with a toothbrush or denture brush and an effective, non-abrasive denture cleanser (no dentifrice). Daily soaking in a denture-cleansing solution – this seems to deliver extra chemical breakdown of the remaining plaque and some level of disinfection of the denture. Denture-cleansing solutions should only be used outside the mouth, and denture wearers should strictly follow the manufacturers’ guidelines. Denture wearers should not keep their dentures in the mouth overnight, unless there are specific reasons for keeping them in. This guideline is even more important for people at a higher risk of developing stomatitis and for frail or institutionalised older people. Soaking in a denture cleanser solution after mechanical cleaning seems to be beneficial for preventing denture stomatitis and the potential risk of pneumonia events in these groups of people. All patients who wear removable dentures should be enrolled into a regular recall and maintenance programme with their dental professional. In 2018, National Smile Month will take place between 14 May and 14 June. A smile might be a small gesture, yet it can have a remarkable effect on our state of mind, as well as the emotional welfare of others. Click here to visit the National Smile Month website! How 45 seconds can save your life! 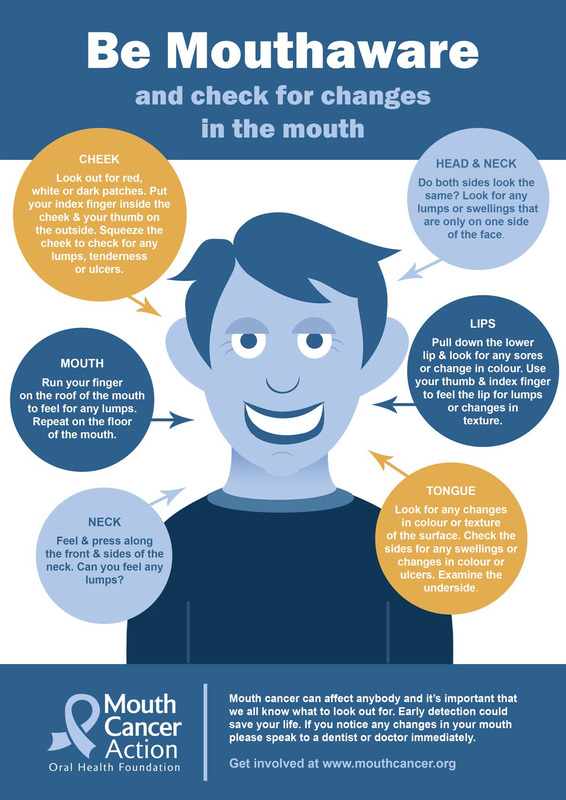 It takes just 45 seconds to check your mouth for any unusual signs, and prevent mouth cancer, says the Oral Health Foundation. 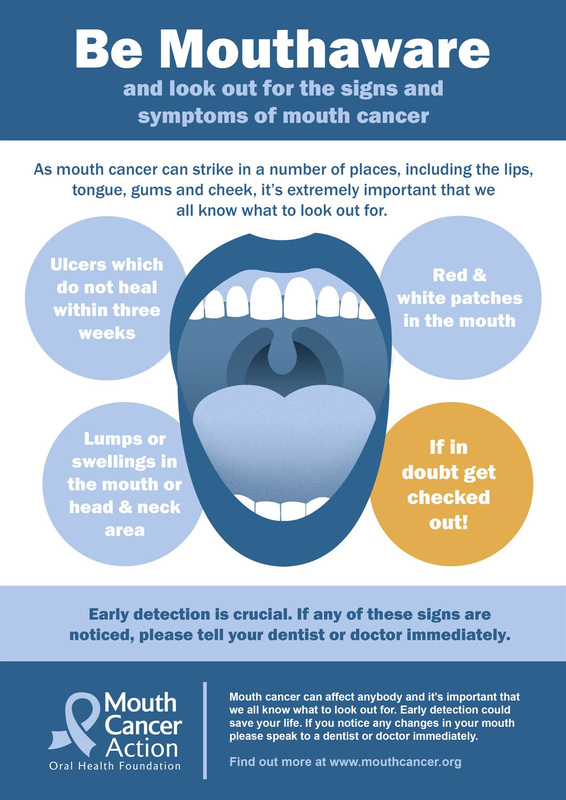 November is Mouth Cancer Awareness month, and we’re here to look after your oral health. Check the info below and keep in touch! Have you ever wondered if you’re doing the best you can to take care of your Oral Health? These Frequently Asked Questions from the Oral Health Foundation will let you know if there’s anything more you can be doing to look after your smile. Should my gums bleed when I clean in between my teeth? It’s been National Smile Month! Find out from your Dentist about how you can improve your smile, or check out the Oral Health Foundation’s info here. In the UK, more than 7,000 people were diagnosed with mouth cancer last year. The disease has grown by a third in the last decade and remains one of very few cancers which are predicted to increase further in the coming years… that’s why Mouth Cancer Action Month is so important. Do you know the changes in the mouth that you should be aware of? Be Mouthaware! For more info and to find out more about how you can prevent Mouth Cancer, visit http://www.mouthcancer.org.